Useful and colourful wall hanging which can be used throughout the Christmas season. The large scale black and white charts are printed 10 stitches to one inch on two A3 sheets. One sheet has the top of the wall hanging with an envelope design worked over 70 by 50 stitches. The second chart has the front of the wall hanging which is worked over 130 by 105. The pattern uses 14 shades of stranded cottons in cross stitch, long stitch and backstitch. 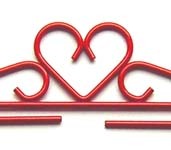 The design must be made up when stitched and the red heart hanger illustrated not included in the kit, is available from our Supplies and Accessories Section.